Step 4 Solve for the variable. So, there are four solutions: -2i, +2i, -5, and +5. The equation x4 - 21x2 - 35 = 65 written in standard form is x4 - 21x2 - 100 = 0. 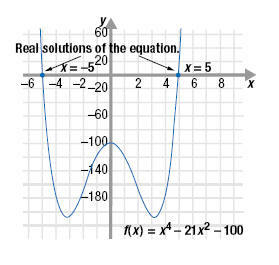 The graph of the corresponding function, f(x) = x4 - 21x2 - 100 is shown. The graph crosses the x-axis at only two locations, x = -5 and x = 5. This is because these are the only real number solutions.